Sebastian Castro is White Party's Official Ambassador! All eyes are on Malate, the heart and home of Manila's lesbian, gay, bisexual and transgender (LGBT) nightlife as it celebrates the 12th White Party Manila on June 29. 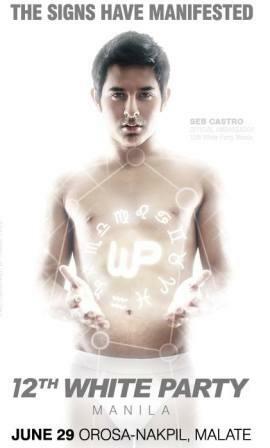 Internet sensation celebrity Sebastian Castro graces the event as the face of White Party Manila. The openly gay painter-singer is an advocate of gender equality, widely accepted by the Filipino LGBT community for being proud of his sexuality. Started in 2001, the White Party is the largest annual gathering of LGBTs and avenue for celebrating equality, unity, and acceptance. Chelu Productions, in coordination with the Malate Business Association, spearheads this year’s White Party celebration alongside several organizations promoting LGBT-related advocacies. For its 12th year, a whole new program dazzles the White Party guests celebrating the efforts and the triumphs of the LGBT community towards equal rights in the Philippines. The street party starts at 8PM featuring the latest club music from select DJs, with guest performances and special production numbers. General admission is Php 200 (entrance only) and VIP tickets are at Php 1000 with unlimited drinks.